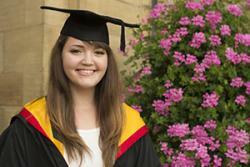 Four years of hard work have paid off for a Bangor University languages student who graduates this week. Christine Jolley, 22, from Wolverton, Milton Keynes graduates with a BA French, German and Spanish degree and will soon be jetting off to Québec, Canada for a one-year teaching post. Christine also won the Dr Barbara Saunderson Language Prize which is awarded to a student for their excellent work by the Board of Studies of the School of Modern Languages on the advice of the relevant Examining Board. Dr Saunderson, who endowed the prize in 1997, graduated from Bangor and was a Lecturer in French here from 1964-2004. The prize was first awarded in 1998 and its value is £100. Ecstatic to be graduating, Christine said: “I chose to study at Bangor University as it offered me the perfect course in a beautiful location. The staff at the School of Modern Languages were so friendly and helpful during an open day I attended. They made me feel that I could easily fit in there and I felt very welcome. Bangor as a city is very convenient as everything is in walking distance. Although it is quite small, it offers something for everyone and it also has a real student community feel that I was excited to become a part of. “After completing the first semester of my second year, I studied abroad for the following three semesters. I spent one semester in Lyon, France, one semester in Leipzig, Germany, and one semester in Salamanca, Spain. It was an amazing experience and gave me the opportunity to not only develop linguistically, but also personally. I also got the chance to travel to some beautiful places which I wouldn’t have been able to do were it not for the Erasmus programme. “Spending three semesters abroad enabled me to meet lots of amazing people from all over the world as well and create lifelong friendships. I could also experience the culture of the places I went to - I believe the best way to do so, is to go to the country itself and live there. I learned so much during my time abroad and I wouldn’t hesitate to do it all again. “After I completed my first year, I au-paired in Spain for the summer. This was a fantastic opportunity to improve my Spanish and work abroad for the first time. After my second year, I worked at the London Paralympic Games which was amazing. Being part of something so huge was a great privilege and I would jump at the chance of doing it again. After my third year, I worked at a hotel in Barcelona during the World Aquatics Championships. Again, it was amazing being part of such a massive event and it gave me the opportunity to meet some great people and rub shoulders with some of the world’s best athletes, which I won’t forget in a hurry! “During my final year, I worked at Bangor University Open Days and UCAS tours. I had a really good time interacting with potential Bangor students, giving tours and presentations on student life. It was a privilege to represent the University. I was only required to work for a few hours or maximum one day a week so it didn't put too much strain on my university workload. “Next year, I’ll be going to Québec to work for a year as a teaching assistant at the École Barthélemy-Joliette. I applied for the role because it will give me the opportunity to gain some invaluable experience in a part of the world I would find difficult to go to if it weren't for the British Council. Québec in particular will provide me with a different angle of the Francophone world, especially of Québecois French and its culture as I'm more familiar with Francophone regions and countries in Europe. I'm most looking forward to going somewhere completely new and different, even though it is quite scary at the same time!